Back in 1957, when an average car sold for $2,750 and a dozen eggs cost 28 cents, the North Dining Hall was built on the last open space on the North Quad. Thirty years later, in 1987, the hall was expanded with the addition of a second level. Now, 60 years later, the building is undergoing a major structural and interior overhaul. 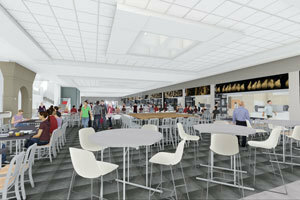 The renovation will proceed in five phases, with Phase I currently underway. Phase II occurred over Christmas break, when the entire building was closed. Phase III will begin at the start of 2017 spring semester; Phase IV will be over spring break; and Phase V is scheduled at the conclusion of the spring semester, again with the entire building closed down. The building will reopen in early August, in time for residence hall staff orientation. In order to offset service delays and reduced seating during Phases III and IV, when parts of the building will be closed, continuous dining will be available at both the North and South Dining Halls from 7 a.m. to 9 p.m. Monday-Thursday; additional Flex Points added to all on-campus resident meal plans for the 2017 spring semester; and changes in the offerings and hours of operation at other campus locations, such as the Huddle Mart, Au Bon Pain Express at Hesburgh Center, Decio Café, Café de Grasta and Reckers. All 139 North Dining Hall staff will be redeployed throughout Campus Dining and other University units while the building is closed. “Our staff and students matter, and we have been very intentional and deliberate in our approach to managing all details relevant to the rollout of the new North Dining Hall,” said Chris Abayasinghe, director of Campus Dining. Originally published by Colleen O’Connor, NDWorks at news.nd.edu on January 25, 2017.